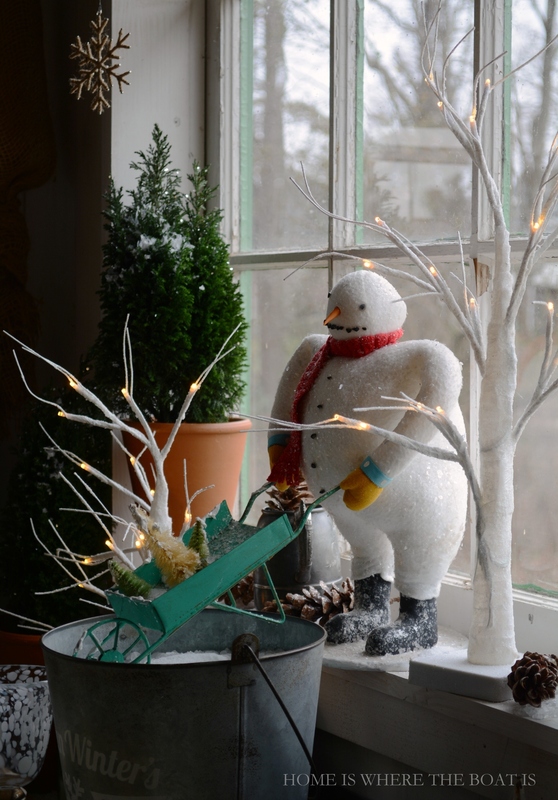 I’m celebrating winter in the Potting Shed with snowmen. . . Snowy white & wise owls have flown the coop to make way for snowmen. 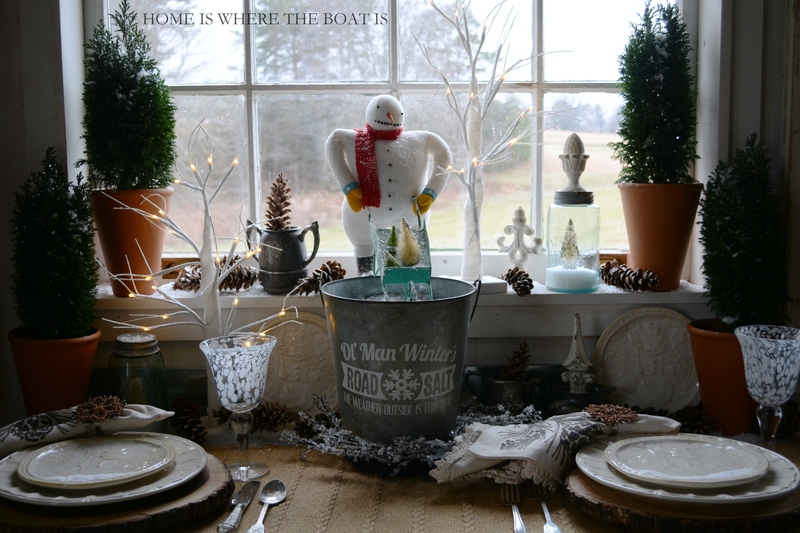 . .
And while the weather outside is frightful, snowmen make winter dining more delightful. 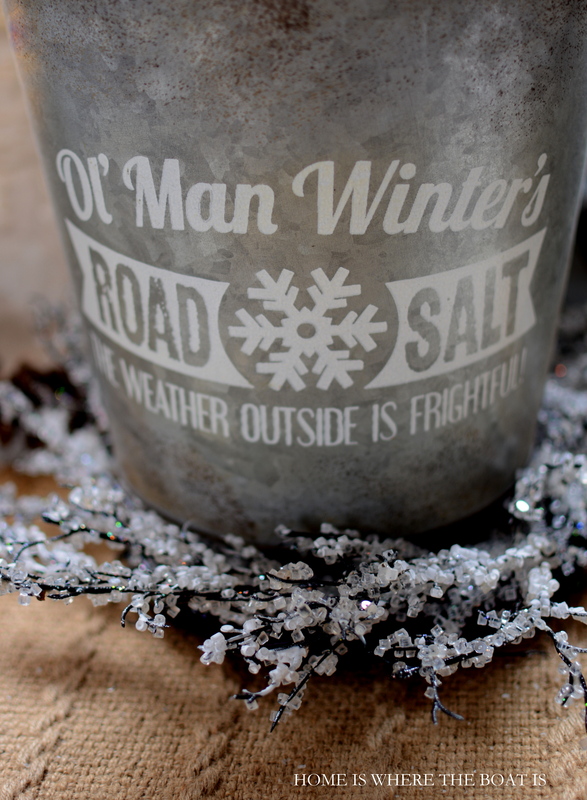 A bucket of Ol’ Man Winter’s Road Salt is filled for ice removal. . .
And a snowman with wheelbarrow is ready for winter gardening. Snowman plates have a light dusting of snow and flurries are in the forecast with snowy goblets. 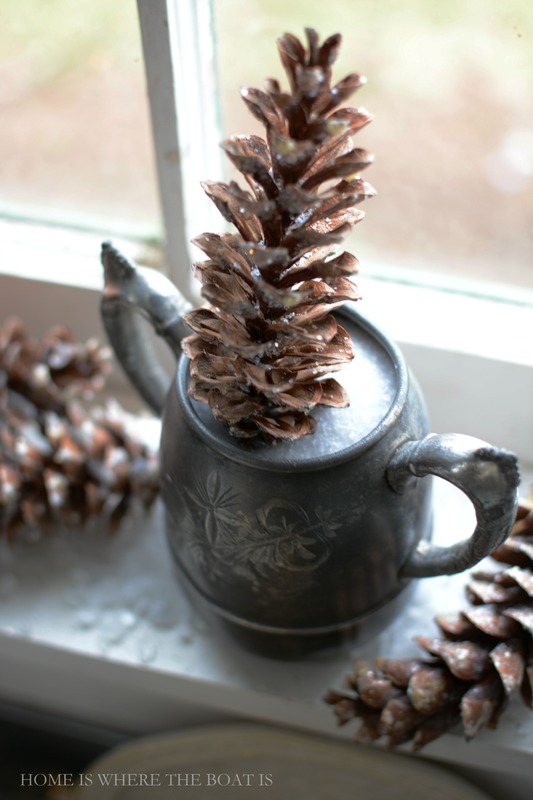 A wintry mix of rock and epsom salts is sprinkled on the surface of the window ledge and in cups. 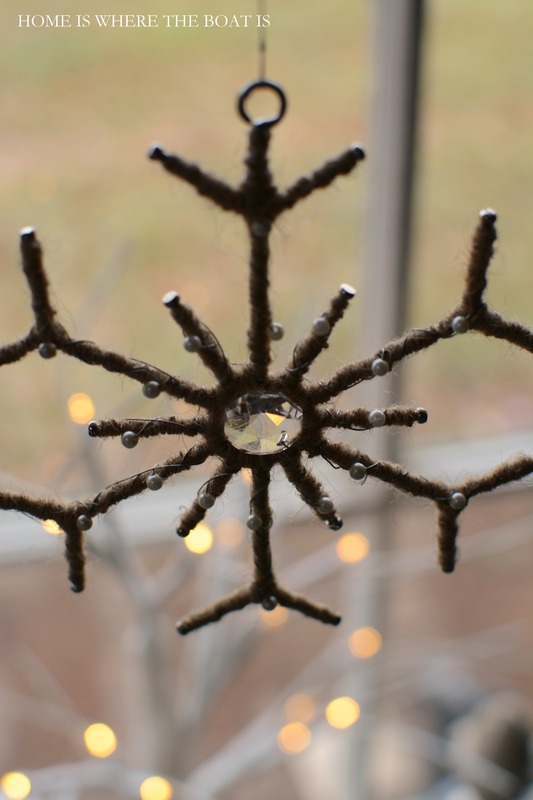 Jute wrapped snowflakes are suspended and falling from overhead. . .
And snowy white trees are providing a little light for gray winter weather with LED lights on branches. I am really loving those plates Mary! Gorgeous tablescape. Very pretty, I love snowmen and always have them out for January. Snowmen are popular. I love them. 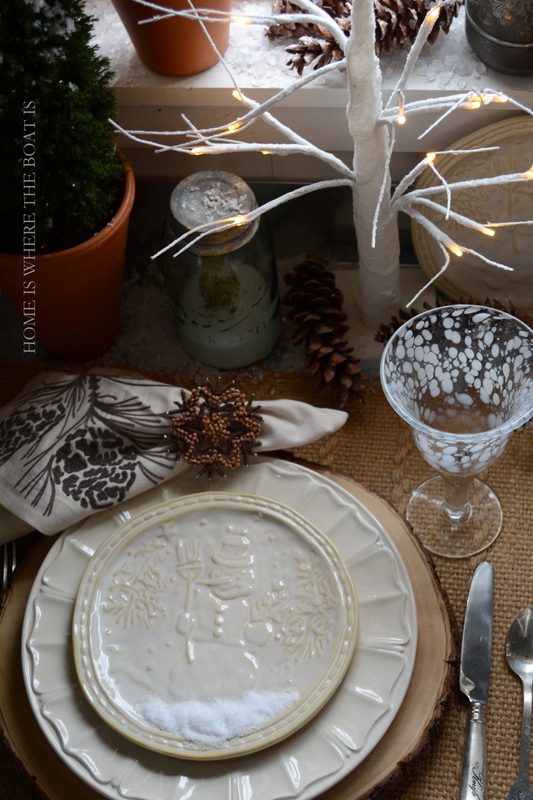 Love the snowman plates and the little trees you found at Kohls … so many goodies in after season sales. I’ve run out of room, but I still look! Stay warm. The snowman plates are just adorable Mary, but your snowman gardener is about the cutest thing I’ve ever seen! 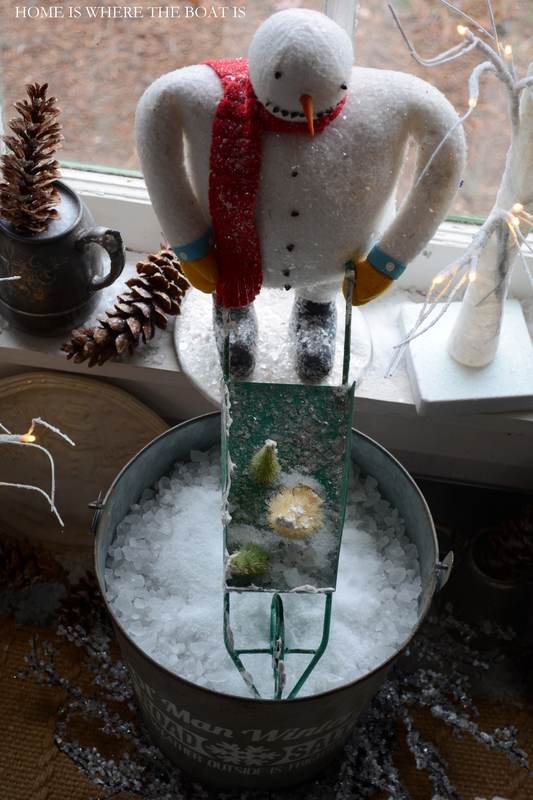 I love his funky folk art style and his green wheelbarrow in the rock salt snow~ what a wonderful snowy scene! And to be greeted by your well dressed snow woman is so much fun~We have BRRRR cold temps but so far the white stuff has stayed to the north! 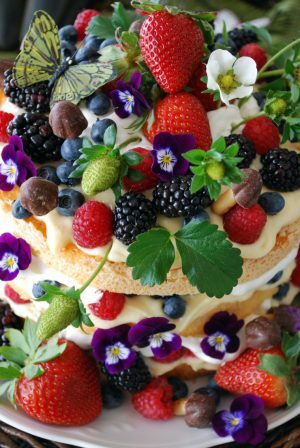 Another showstopper! Or should I say ‘snow-stopper’? Thank you for sharing these delights. Winter is hard to get thru mentally, and your pics are great medicine. You brought total delight to our cold, gray day. 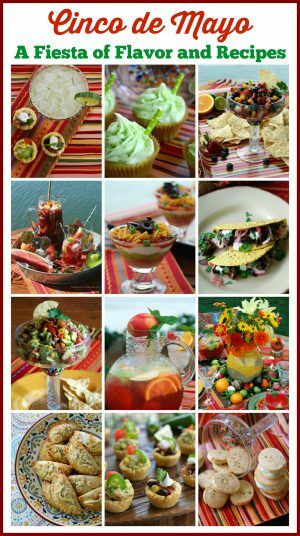 What inspirations, what fun….. Thank you, Mary. Love everything about this one especially all of the “woody” chargers, napkins rings, snowflakes, etc. I put all my snowmen away and I think that chased the snow away too:( We got maybe a half an inch from the “epic storm”!!! 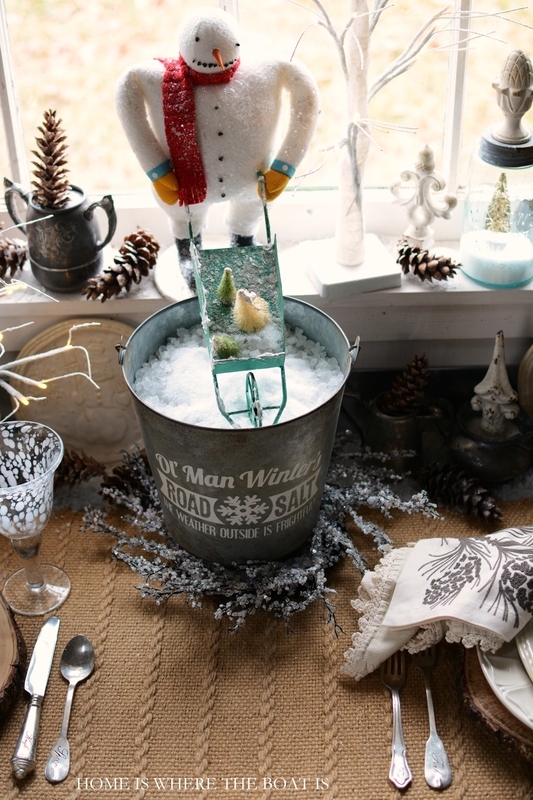 This is fabulous, I adore that snowman with the wheelbarrel! Just adorable. Your tablescapes are always my favorite features that you do! I imagine being tucked inside peering out at the snow enjoying the snow-muffled quiet from inside your potting shed. After yesterday’s 22″ of snow I think we can make some snowmen! 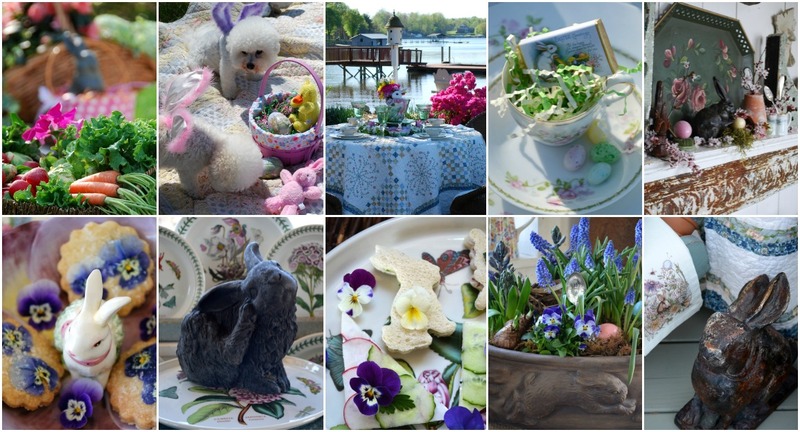 Love the snowmen plates and your table decorations! Hopefully leaving for Florida Friday. Flight got cancelled for today! YOUR SNOWMEN IS GREAT AND THE DISHES ARE TO DIE FOR , I LOVE SNOWMEN AND TRY TO KEEP THEM OUT DURING OUR 8-9 INCHES OF SNOW WE GOT THIS WEEK IN PA.
Do We Have Snow ? How about almost THREE FEET ! I’m just outside of Boston , It’s Beautiful , but too Light and Fluffy for SnowMen ! Thank-goddness , cause’ now we have to Move It Around and try to get back to normal ! Luv The Potting Shed though . What an adorable snowman table for two, Mary! Those embossed plates are just the cutest and I love the wood slice chargers. The white, light up trees are perfect for the scene to add a little glow and ambience. No, we don’t have any snow…temps will be in the 70’s today! Your snowy scene makes me smile though. My snowmen never came out to play this year, so it’s extra fun to see your gardening guy. You continue to amuse me with your clever, creative vignettes. Thanks for always adding a touch of joy to the day! I love snow and am ready for at least six inches! 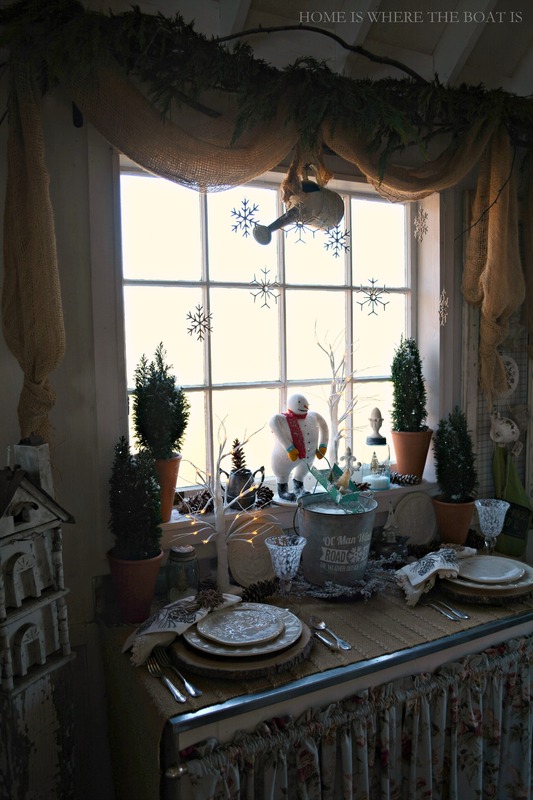 Just love your potting shed’s wintry dressing. So cute! So clever! So inviting! Mary, I adore your snowman vignette. 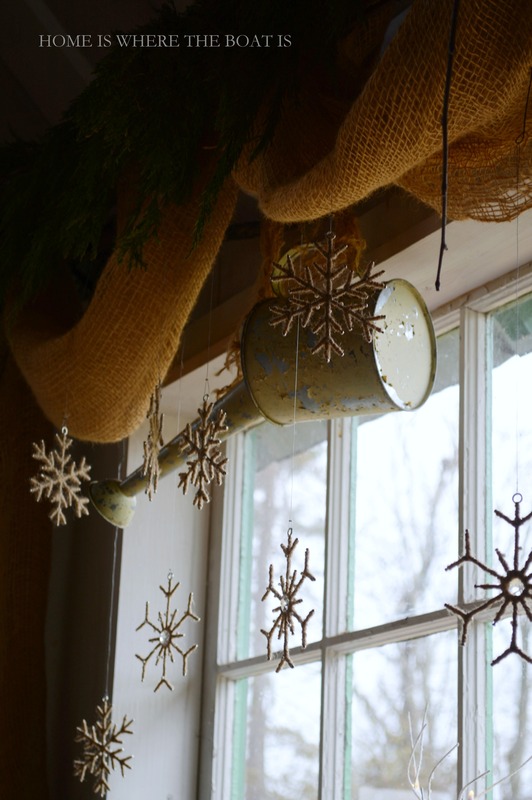 There’s so much to savor–the icicle sun catchers; the dinner plates, the charming snowman pushing the wheelbarrow (which has it’s own darling touches). What a charming way to celebrate the beauty of winter! Stay warm. Love, Love, Love this! Snowmen are my favorite! The Snowmen plates are so awesome! Love them! Thank You for sharing your snowmen and putting a smile on my face! Love it all! We have 2 ft. of snow here in MA! It is pretty, but makes things a bit difficult. I love your plates and snow man. I have a pretty window in my Potting Shed, but it buried in snow and oh so cold this time of year. Not to mention all the pots and yard stuff gets put in for winter. I enjoy how you use your shed and I am inspired by your vignettes. As usual Mary, your setting is lovely! I too have snowman out in January. They help keep from being depressed after all the Christmas pretties are backed away! 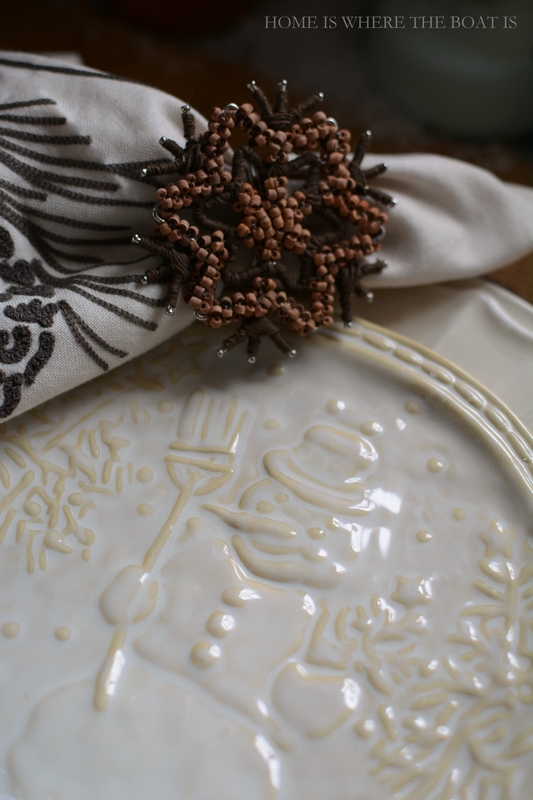 Love your beautiful tableware and your snowman. Everything is so beautiful and creative!! Our area got about an inch of snow two days ago. Not much of a winter here. I love that the snowmen and ladies have taken over the garden shed having a great time while they can. 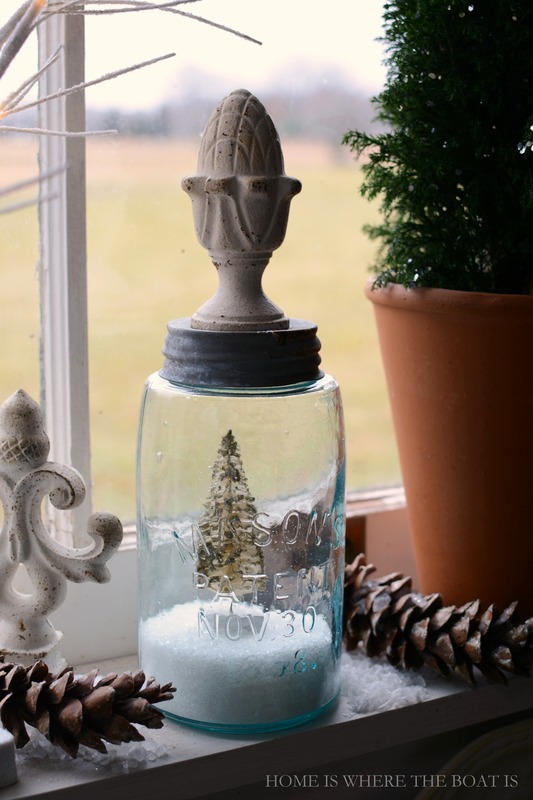 Glad you trained that snowman to do some winter gardening!…Love the dinnerware…the snowflakes dancing in the window and all of the snowy effects of winter in the garden shed. … No snow yet, and I am not complaining!!! Too cute! Love the snowman dishes and everything else, as always! We have a few inches on the ground and may get 1 -3 tomorrow which is o.k. Nothing like the “record breaking” last winter when we had 88+ inches. It snowed so much there was no where else to throw/ blow it, we had “walls of snow”. So glad we aren’t breaking any records this year! ha. Adorable post as always!! I haven’t left a comment in awhile work is keeping me busy, but I always have to take a peek at my favorite site !! p.s. not to much snow this way yet that is. Oh my goodness! Do I love that snowman gardener or what? Cute, cute, Cute! I love all the details. I also decorate with snowmen throughout the winter. 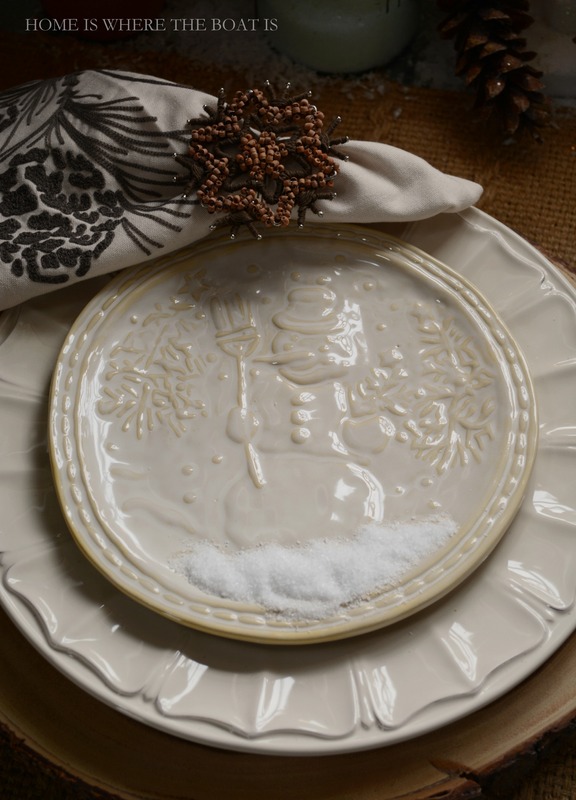 Your snowmen dishes are adorable! The snowman made out of wreaths…wow! So much inspiration. Do I have snow???? Hahahahaha…you betcha but I’m sure not having the same kind of fun with it that YOU are, Mary! Adorable collections beautifully combined to create this moody grey scene…very well done! It took me 3 tries to get my car up my icy, snowcovered driveway last night (we PAY people to clean it, too)….hurry up, SPRING!!!! Cute, cute table, Mary. 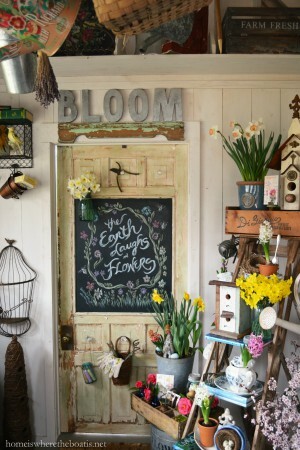 I love your potting shed! I love it all especially the snowman with the wheelbarrow and the bucket! How cute!! Lovely! 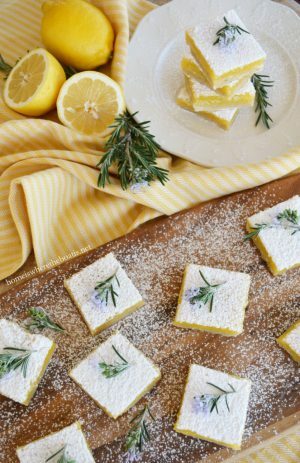 Those snowman plates are wonderful. Love everything about this table!